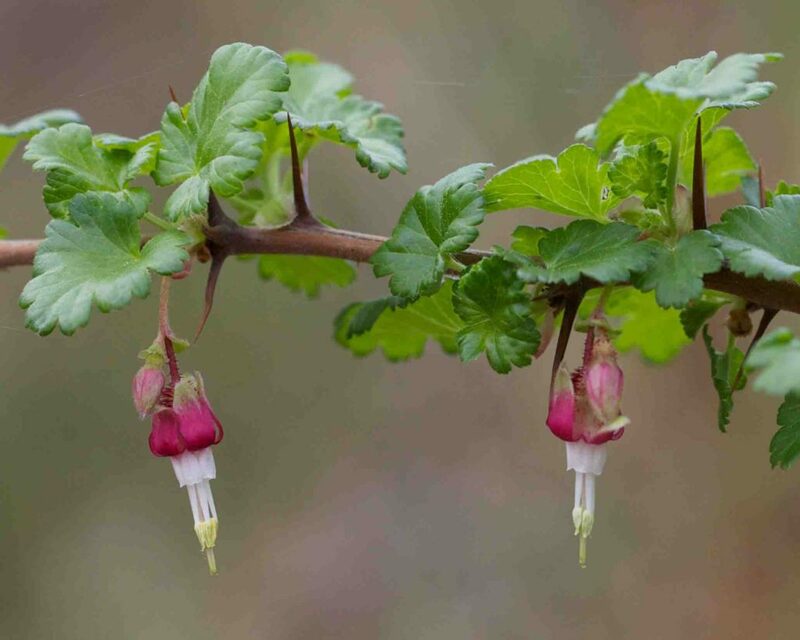 The Gooseberry family contains a single genus Ribes which includes both currants and gooseberries. These two groups can be distinguished by whether or not the stems have the (prominent and extremely sharp) nodal spines. 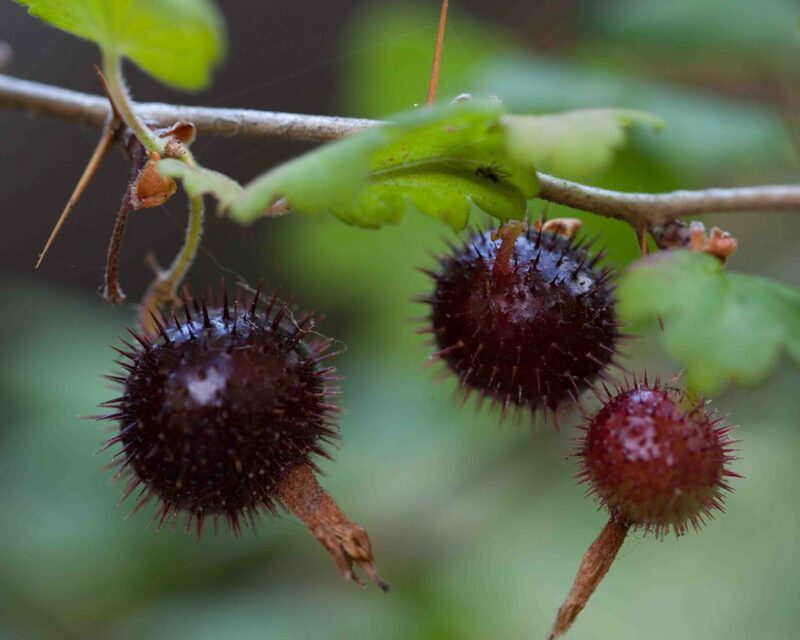 Gooseberries have them, currants do not. 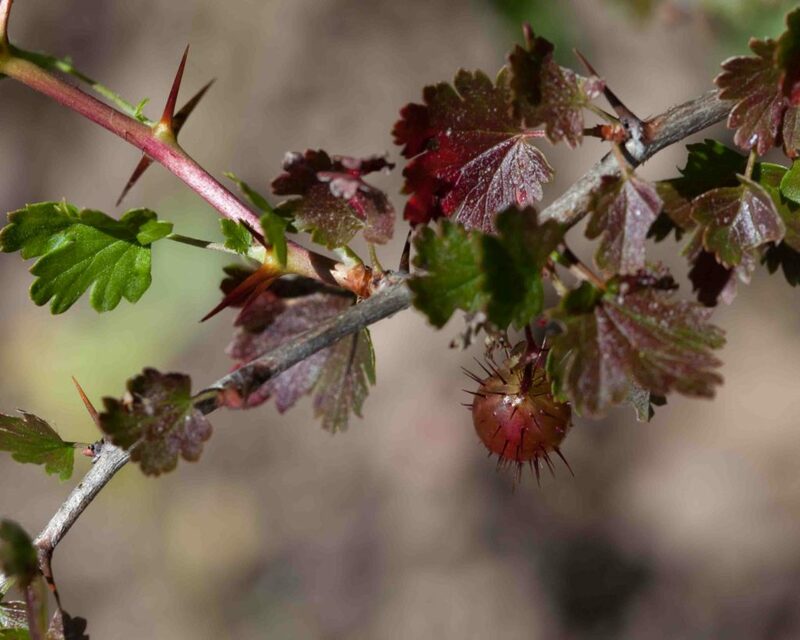 In addition, stems of certain gooseberries can be extremely bristly between the nodes; an important but not always reliable diagnostic feature. 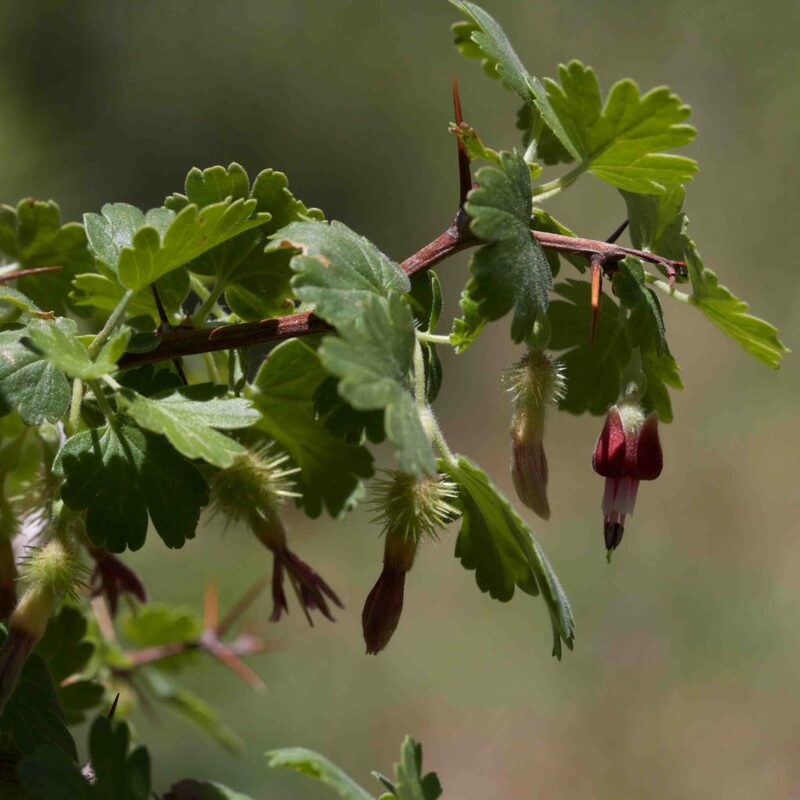 Gooseberries can be tricky plants to identify. 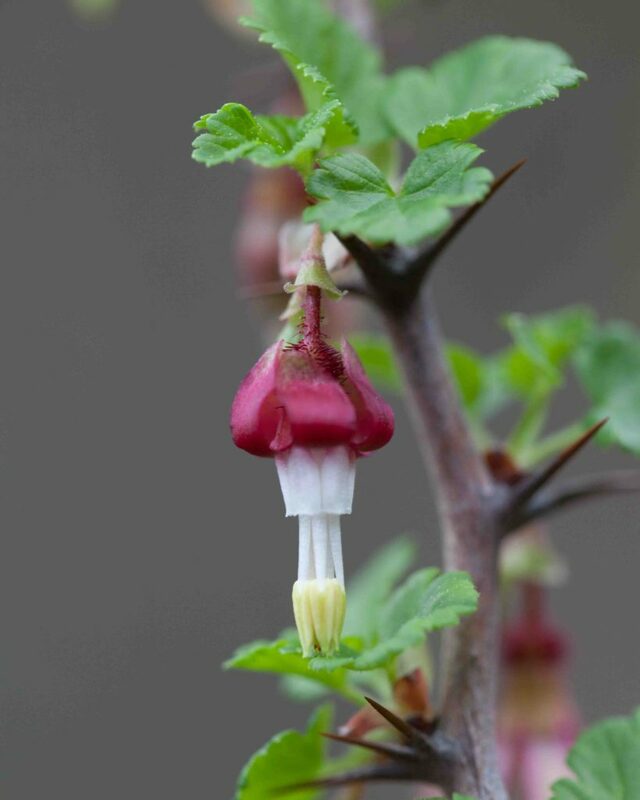 The books include detailed descriptions of particular differentiating features but experience in the field suggests that not all plants exhibit all of the features that they are supposed to possess. 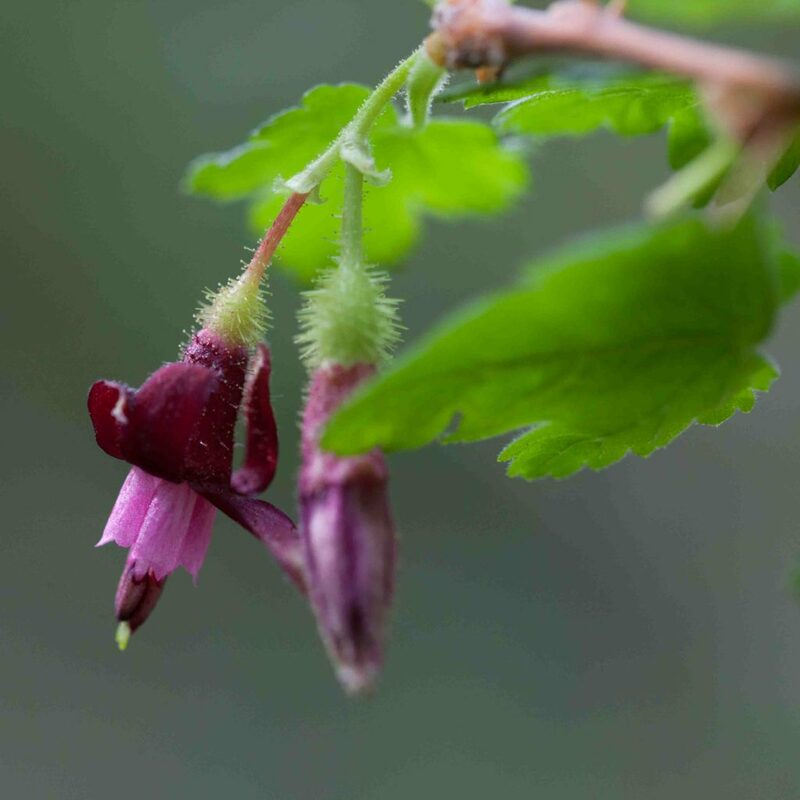 It appears that the most reliable distinguishing characteristics are the length of the petals relative to the stamens and the color of the anthers, but other factors will often need to be taken into consideration. 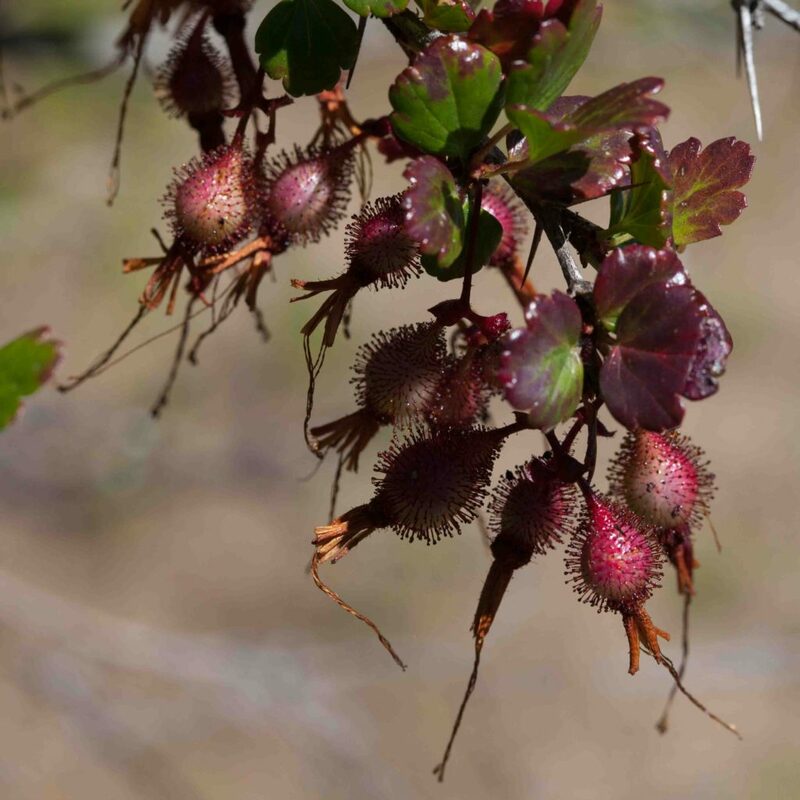 The fruits are edible and generally tasty but often prickly and so need to be eaten with care. 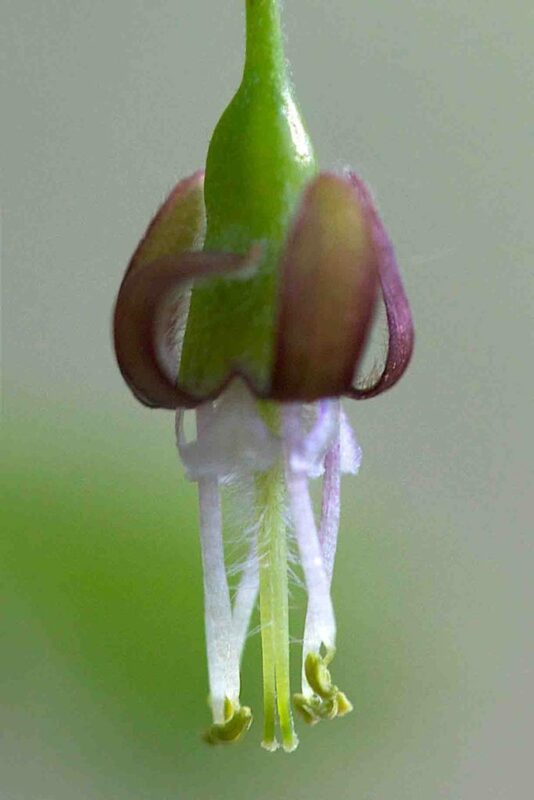 Note: when reference is made to the relative length of stamens and petals, both are measured from their base, so a stamen 1.5 × the length of the petals will be exserted half the length of the petals. 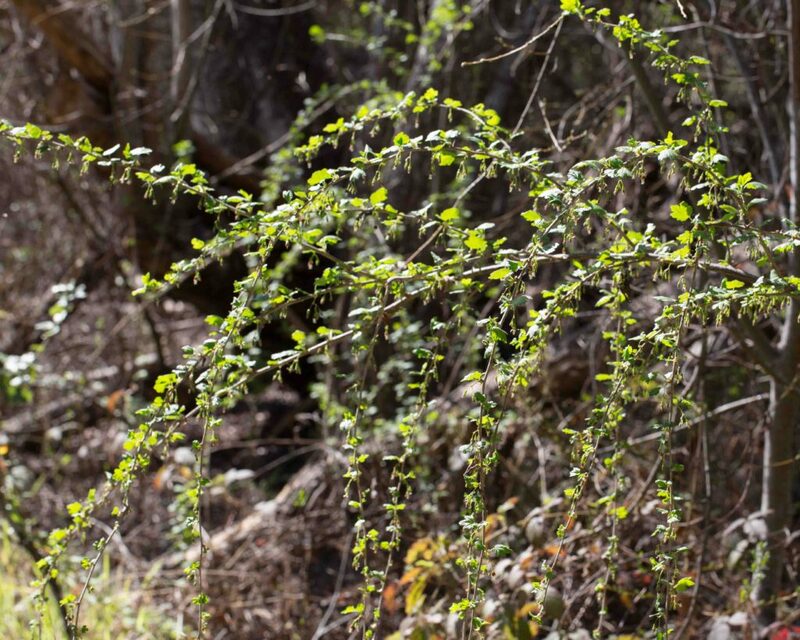 Stems of this shrub have 3 nodal spines but lack internodal bristles. 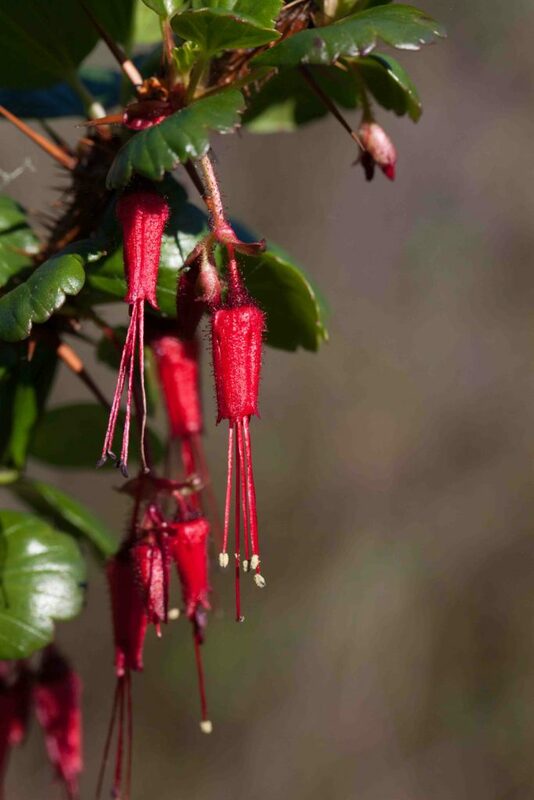 Flowers have maroon anthers. 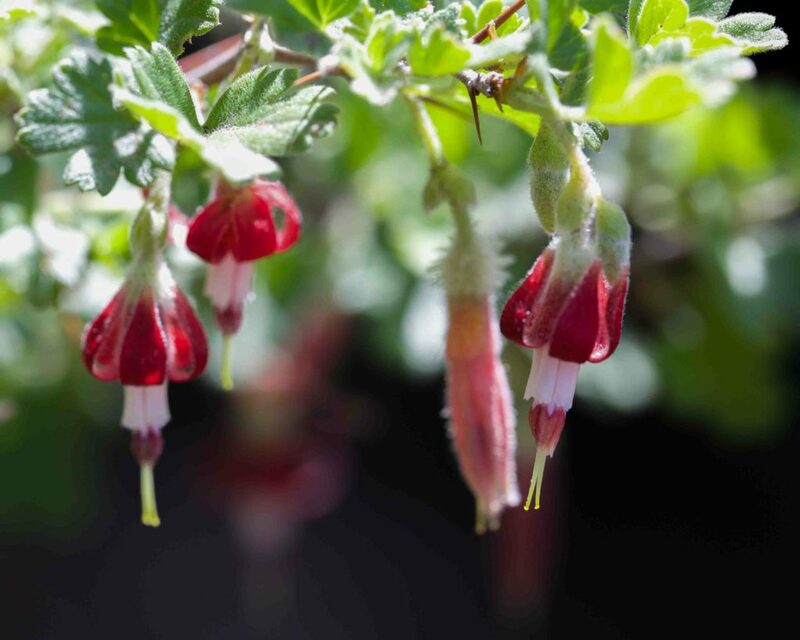 The petals seem more often pink than white and the sepals are pure maroon. Stamens are up to 1.5 × as long as the petals. Leaves are glandular below, 2–4 cm long with a petiole about the same length. 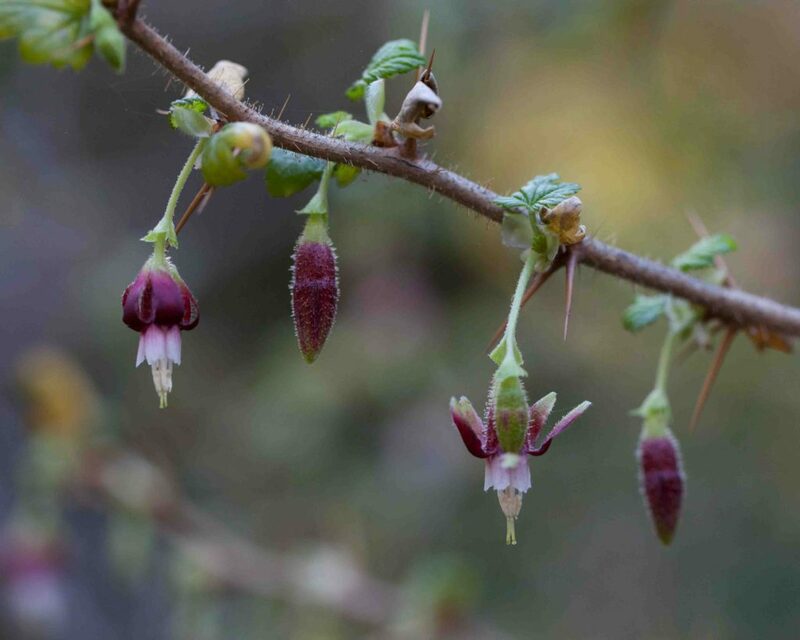 Most or all of the bristles on the ovary are gland-tipped which helps distinguish this species from Sierran Gooseberry (Ribes roezlii). Stems of this shrub have 3 nodal spines but the young stems at least lack internodal bristles. Petals are white and sepals reddish (sometimes green to greenish-white). Stamens are 2–4 × as long as the petals. Anthers are greenish-yellow. 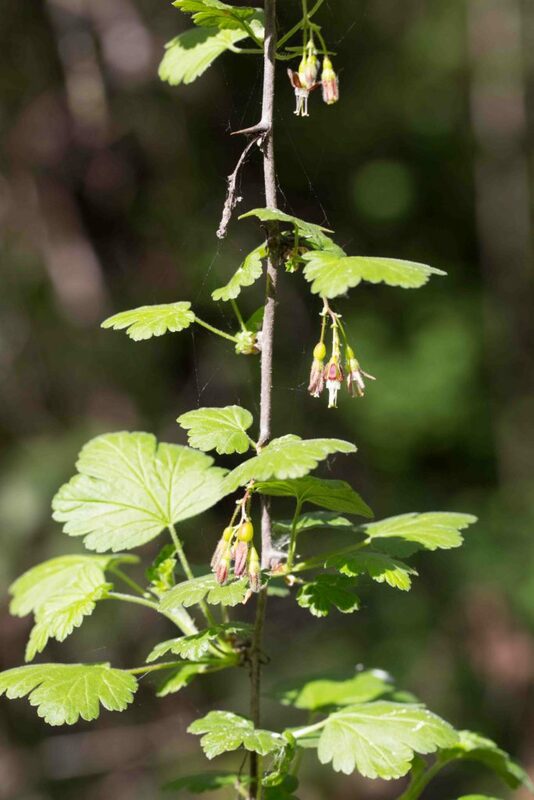 The style is well-exserted and glabrous and the ovaries and berries are covered in short glandular hairs (the converse of Straggly Gooseberry (Ribes divaricatum)). Leaves are small (1–2.5 cm long) with short (< 5 mm) petioles. 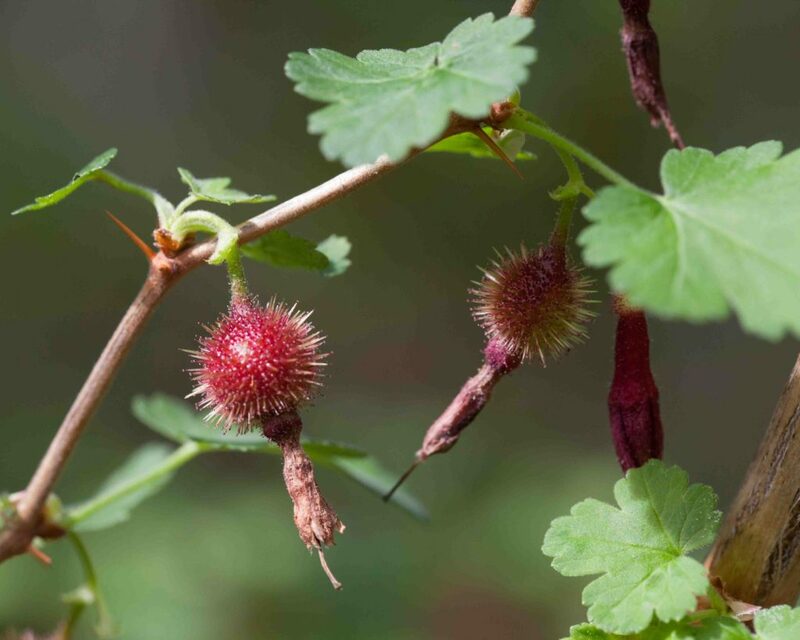 Stems of this shrub have 1–3 nodal spines and may or may not have internodal bristles. Flowers are in clusters of 2–6. Petals and filaments are white and sepals green to dark purple and reflexed. Stamens are 2 × as long as the petals. Anthers are cream. The distinctive features of this gooseberry are the glabrous ovary and berry and noticeable hairs at the base of the style. 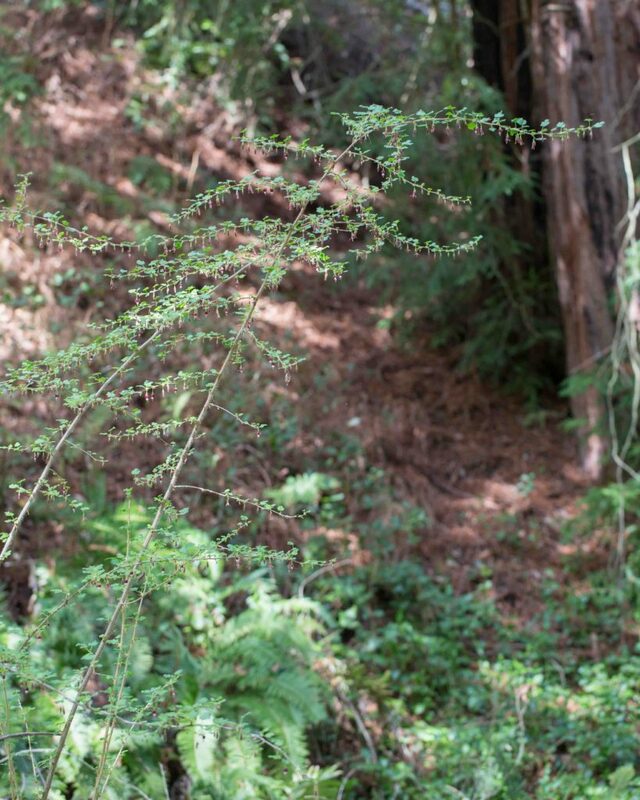 The growth pattern of the shrub amply justifies its common name. 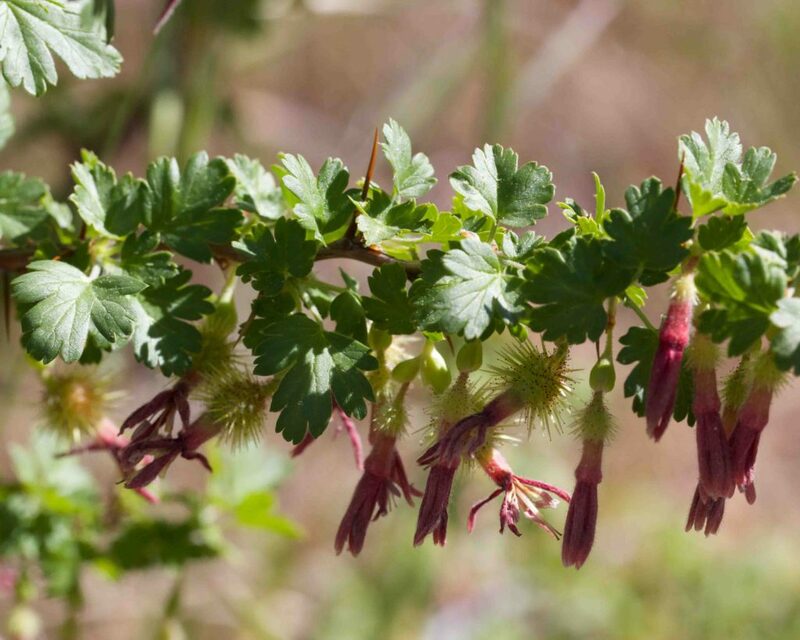 This shrub is distinguished from Hillside Gooseberry (Ribes californicum) by its dense internodal bristles, shorter stamens and white to tan anthers. 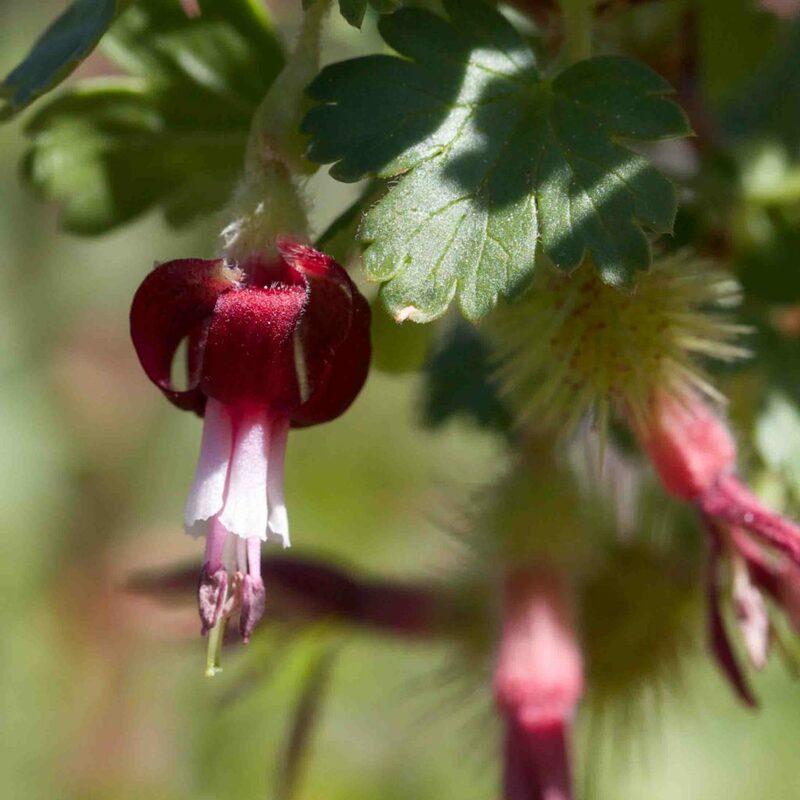 Petals are white to pinkish and sepals red to deep purple. Stamens are barely longer than the petals; styles are well exserted. 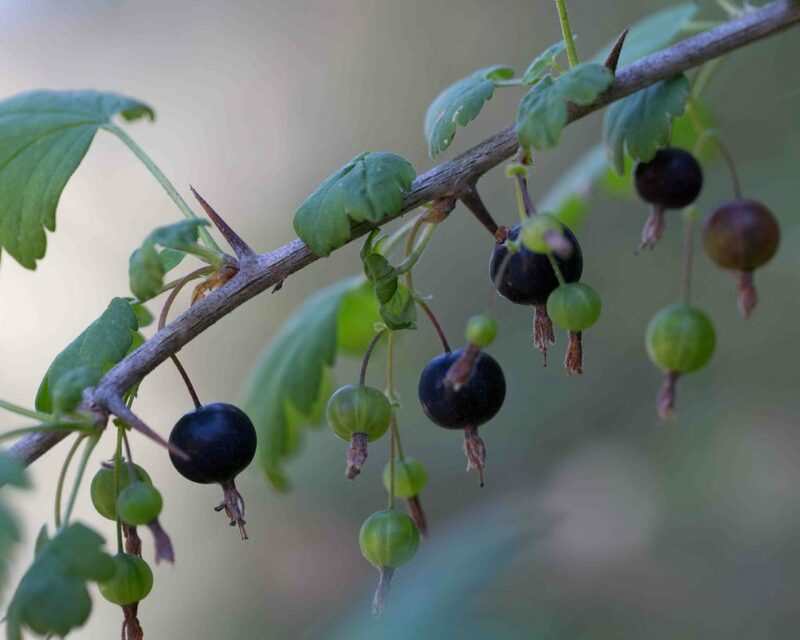 Leaves are 1.5–4 cm long with 1–2.5 cm petioles and, unlike Hillside Gooseberry, are glandular on the lower surface. Some stems have only sparse internodal bristles which can cause confusion. 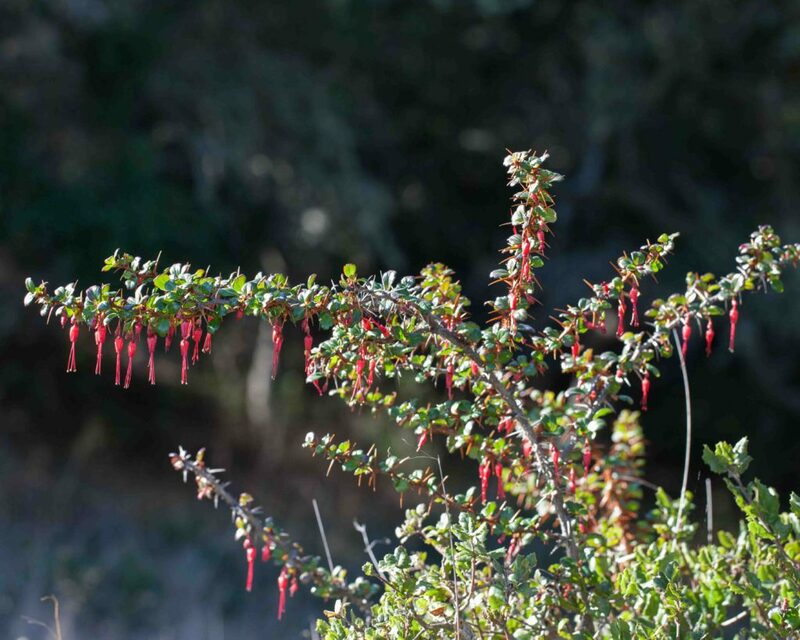 As the name suggests, this is most commonly found in the Sierras but a few examples are found in Monterey County (e.g. Chew’s Ridge). 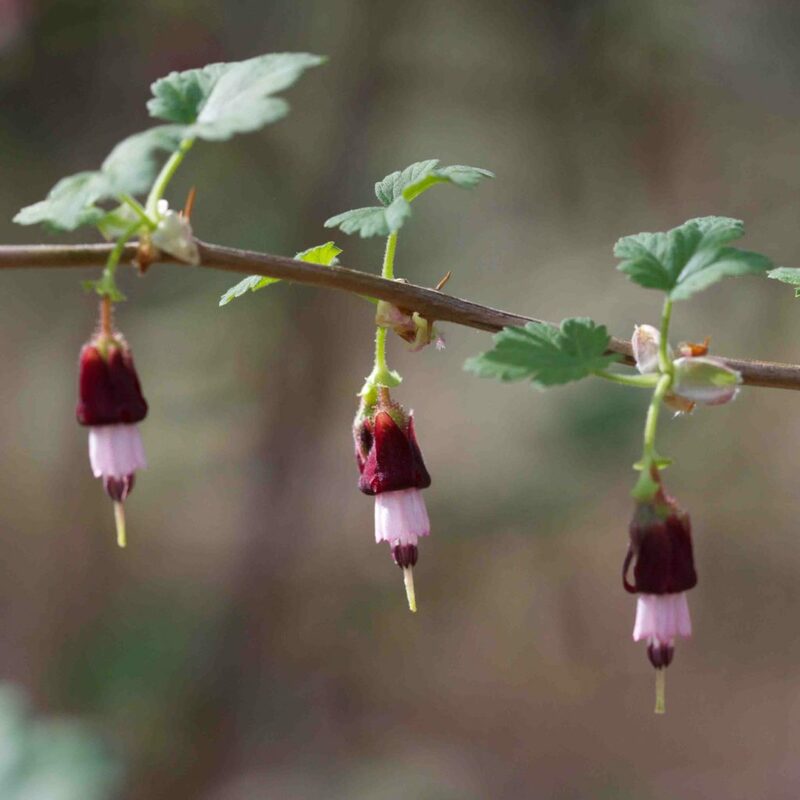 A smallish shrub with dense leaves and flowers. Stems have no internodal bristles. Leaves are not glandular and small (1–2.5 cm long) with petioles < 2 cm. 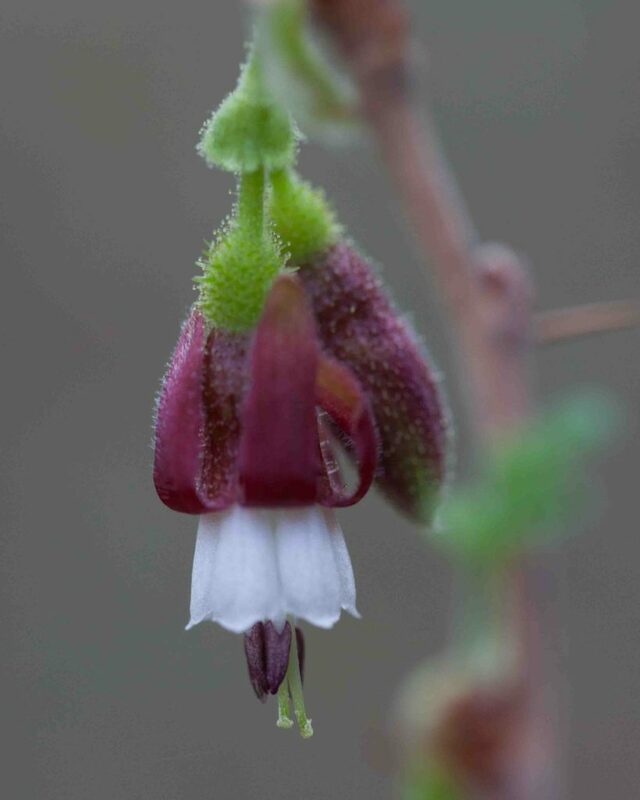 The petals are white to pink-tinged and the sepals maroon to dark red. Stamens are 1.5–2 × as long as the petals. 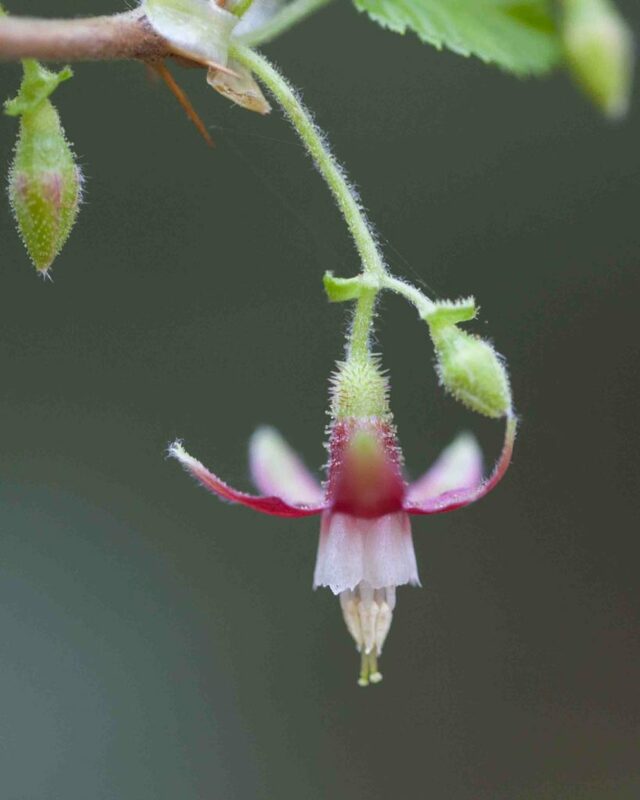 Bracts are as long as or longer than the pedicels, often covering the ovary. 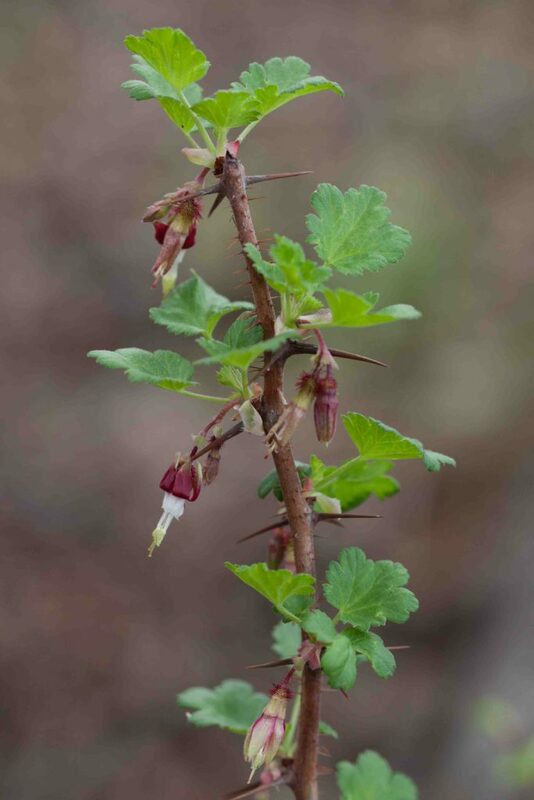 Not unlike Bitter Gooseberry (Ribes amarum) but can be distinguished by the presence of non-glandular spines as well as glandular bristles on the ovary. 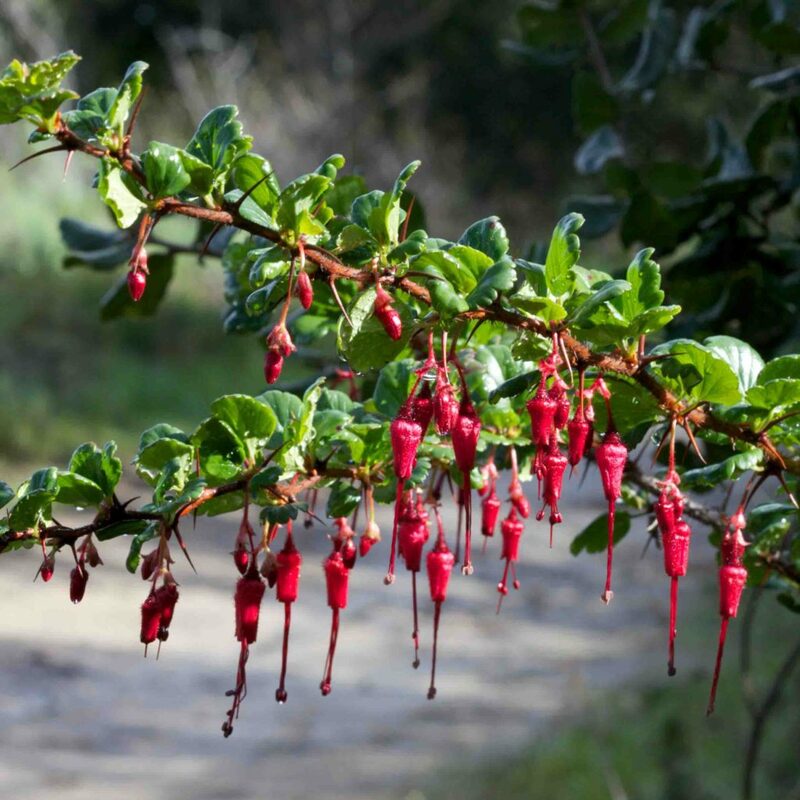 By far the most commonly found gooseberry in the Monterey Peninsula and immediately recognizable by its bright red, fuchsia-like flowers with their long exserted stamens and style. Internodal bristles are present in abundance. Ovaries and fruits are bristly.